We all hoped for the best with Hurricane Harvey and are continuing to hope for the best with Hurricane Irma predicted to hit this weekend, but Hurricane Katrina 12 years ago taught us to prepare for the worst. In Hurricane Katrina, a reported 250,000 pets and 2,000 humans lost their lives — some because they refused to leave their beloved pets behind. After Hurricane Katrina, federal leaders unanimously passed Pets Evacuation and Transportation Standards Act of 2006, guaranteeing that rescue operations would focus on the needs of furry family members in future emergency evacuation situations. With officials directing Gulf Coast residents to stay home as Hurricane Harvey approached, many stayed put with their animals. Then came the storm nobody anticipated — as it intensified, folks were more apt to grab their pets this time around, knowing they are generally welcome on Cajun Navy boats and in emergency shelters than they were in the wake of Katrina. Still, it is inevitable that some pets and livestock ended up lost, stranded, run away or otherwise disconnected from their humans. 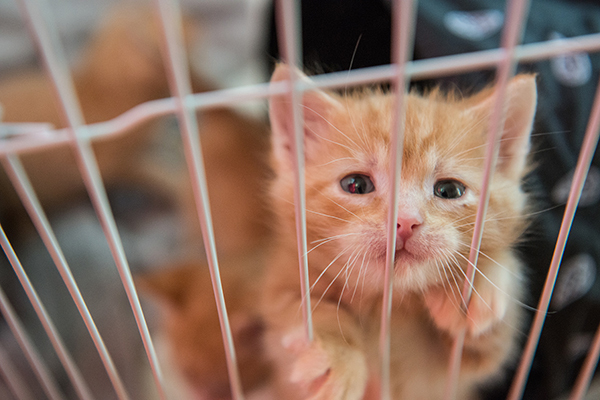 This is where local and national animal rescue organizations are stepping up, and we can help! Hundreds of rescues as far away as Atlanta, New Jersey and Chicago are accepting existing adoptable pets (animals that were already homeless, awaiting adoption before the hurricane) to make room for the influx of lost and founds. A few high-level rescues have sent their expert emergency search and rescue teams in to assess needs and develop rescue plans. 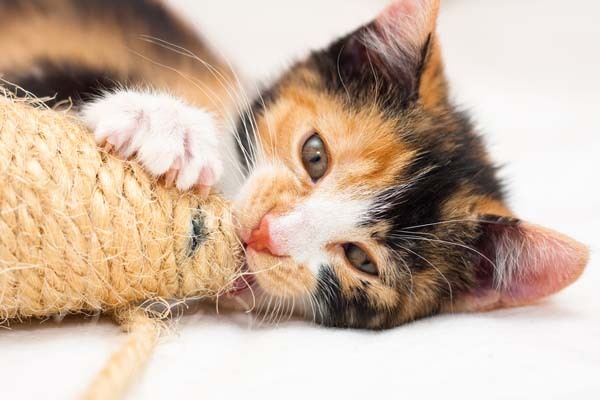 Houston SPCA reported to Catster that it has received 4,000 pounds of cat and dog food from Hill’s Pet Nutrition and Chewy.com has delivered a tractor trailer full of food and crates. PetSmart Charities has given one million dollars in grants to several humane rescues in affected areas, and Petco Foundation has committed over $2.3 million in funding and supplies.. Donations are urgently needed to feed pets that were able to remain with their humans, support efforts to make room for incoming strays, pay professional staff (who are all surely exhausted and working overtime), provide massive quantities of supplies and even provide transportation services regionally and locally with programs such as the New York City Mayor’s Alliance Wheels of Hope. Rescues in affected areas and at emergency partner intakes across the country are also eager to put volunteers to work. The best way to find out how you can donate time it to visit your local rescue’s Facebook page for information and updates. Below are links to organizations accepting donations, ways to helping reunite pets and their people and other information on how you can support. For local residents who may have lost a beloved pet or who are fostering a found pet until his or her owner can be located, there are some useful website and apps to share lost and found listings to assist reunions. Once safe to travel, if they don’t already have a coordinator helping with this task, ask your local animal care and control center if you may post a photo with a description of your lost pet and your contact info. Keep an eye out for social media pages dedicated to lost and found Hurricane Harvey pets. But be wary of heartless scammers asking for money in exchange for your pet. This is not okay, and is rarely legit. With Houston being one of the hardest hit areas by the storm, Houston SPCA is currently operating with a skeleton staff of folks able to safely make their way to the shelter. Nonetheless, it is feverishly answering calls for animal rescue. In the area, call 713-861-3010 for emergency-only rescue assistance. Spokesperson Julie Kuenstle reports that the organization anticipates hundreds of injured and orphaned wildlife intakes as flood waters recede. Donations can be made here. This shelter is currently housing at least 19 pets for owners with no other place to leave them, as well as a couple dozen strays, with hundreds more expected in the coming days and weeks. The cost for current intakes alone has topped $25,000 (for staff, supplies, vaccinations, housing, etc.). Donations can be made here. Safe from the harm of hurricane weather, this facility has transported over 330 animals already and expects to take in hundreds more over the next few days. With a stock of animals already waiting to be adopted (these are not orphans from the storm), this is a great place to find your next best friend or volunteer to foster some of the more vulnerable animals (preferably in homes with no other pets). Links to its donate button and wish list of supply needs are here. This amazing, unique animal rescue has chartered several flights already to evacuate homeless animals from the San Antonio area to make room for the influx of lost and surrendered pets to come. Founder Cindy Smith told Catster the organization flew 100 dogs to Saint Hubert Humane Society, 88 dogs and 22 cats to Rancho Coastal Humane Society, Labs and Friends and San Diego Humane Society, and have sent hundreds more cats and dogs to Oregon, Washington, Chicago, Tulsa, Wisconsin and Virginia. Smith says Wings of Rescue will continue to evacuate as many animals as donations allow, in order to make room for hurricane victims. Donations can be made here. This St. Louis-area organization has reportedly taken in 90 dogs and cats already, to make room for incoming hurricane strays. It recently announced on Facebook that it’s sending a rescue team to Harris Country, Texas to transport dozens more out of harm’s way and have committed staff on site in Beaumont for help care for over 300 animals. It’s currently running a “Purricane Adoption Special” with adoption fees waived for all adult cats, and reduced to $75 for kittens. Donations can be made here. 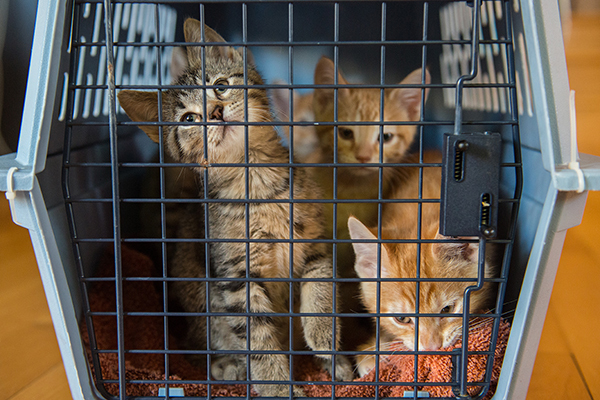 Not safely out of the storm’s path themselves, this shelter transported over 100 animals to Greater Birmingham Humane Society to make room for local needs post-storm. It has also coordinated airlift missions to send animals to emergency intake partners in Maryland, Pennsylvania and Virginia. 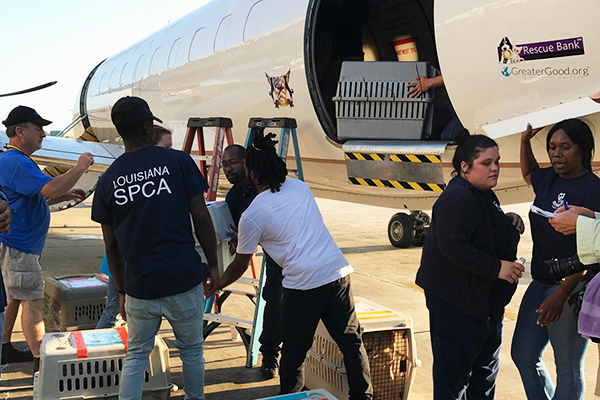 Another flight is planned to remove another 100 animals this week, allowing them to partner with Houston SPCA and Texas SPCA to take in any animals as needed. Louisiana SPCA has also made preparation for local rescue, should the need arise. For emergency-only help in New Orleans, call 504-368-5191 x 100. Donations can be made here. 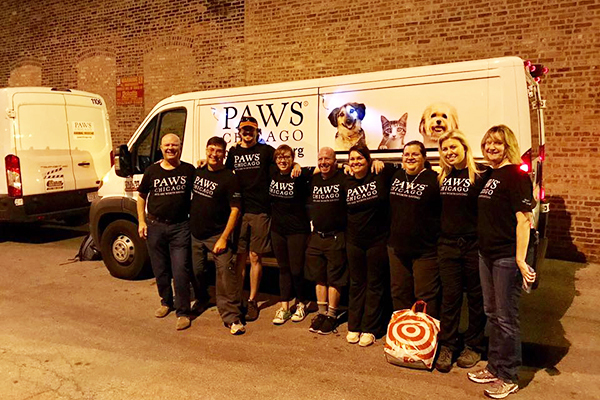 Old hands at helping its friends in the south, with rescue experience after Hurricane Katrina and the Oklahoma tornadoes, PAWS Chicago did a trip ahead of the storm to bring 26 ready-to-be-adopted cats and dogs to Chicago. Representative Sarah McDonald informed Catster that the PAWS Chicago team made a second caravan to Texas with medical staff and volunteers once roadways were safe for travel — bringing an additional 43 in-need animals back to Chicago, making room for pets lost or orphaned in the hurricane to be reunited with their Texas families. Donations can be made here. The expertly trained search and rescue crew of this group have deployed with a fleet of boats and trailers to assist with emergency rescues in Beaumont and Jefferson County areas. It also deployed a mobile medical unit to treat injured animals. ASPCA is establishing and managing an emergency shelter for displaced animal victims in Hardin County, Texas, located at Sour Lake Elementary School, to provide ongoing care for displaced animals rescued in the community until they can be reunited with their human families. Donations can be made here. Photography courtesy Best Friends Animal Society. With a team trained for natural disaster and extreme rescue situations, animals of all kinds are in good hands when rescued by this group. The organization sent a crew to the Houston area with boats and a state-of-the-art animal rescue trailer, and it partnered with other state and federal agencies to seek and rescue as many lives as possible. In conjunction with Austin Pets Alive and Houston Pets Alive, Best Friends set up a second massive staging area that has taken in over 650 animals so far, and has just established a new staging area at the NRG Arena in Houston. Its current goal is to reunite as many displaced animals with their original owners as possible. 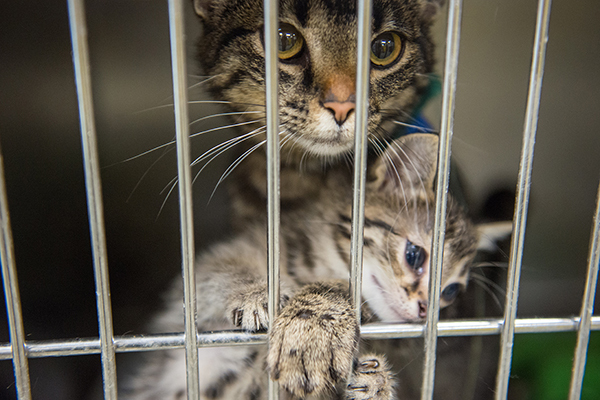 Best Friends recently published an online petition requesting Houston SPCA be transparent in its handling of incoming animals, and demanding a more generous hold on animals to ensure the best possible outcome for found cats and dogs. This petition was quickly reinterpreted by social media users, accusing Houston SPCA of euthanizing dogs — which has been proven untrue by both Best Friends and Houston SPCA. At the forefront of the Hurricane Katrina rescue efforts, and largely responsible for the passing of subsequent legislation protecting pets in times of emergency evacuation, it’s no surprise the Humane Society of the United States is well-prepared to assist before, during and after Hurricane Harvey. 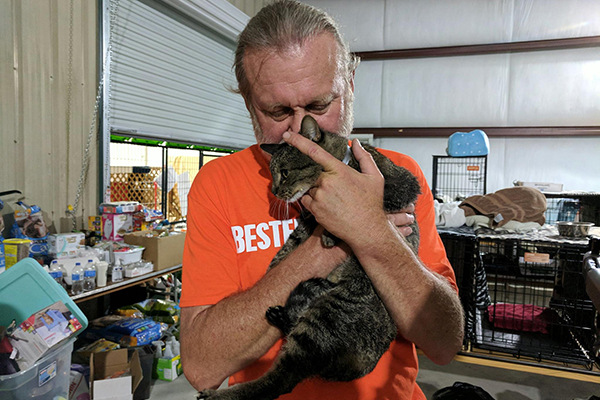 It has been on the ground in Texas since the week before the hurricane, evacuating homeless shelter animals in preparation for an influx of strays and surrenders of biblical proportions. So far, it has deployed expert search and rescue teams to Texas City, Dickinson and League City, Texas and it’s partnering with countless local and national organizations on coordinating efforts, keeping the public informed and developing a safe and strategic plan to secure as many stranded, injured and found animals of all kinds. Text LOVE to 20222 to donate $10 to HSUS Disaster Relief Fund. Donations can be made here. Supporting not only dogs, but cats too, The AKC Humane Fund has donated $10,000 to the city of Houston and deployed an AKC Pet Disaster Relief trailer to hurricane-stricken areas. The mobile unit provides a safe, temporary shelter for up to 65 pets. The trailer can house and deliver essential animal care items including crates and carriers, AKC Reunite microchips and an AKC Reunite universal microchip scanner, bowls, collars and leashes as well as fans, lighting and generators; cleaning supplies and maintenance items. These supplies can be used as co-location shelters, where people can evacuate with their pets, as well as emergency animal shelters for displaced animals. To support the AKC Humane fund, donate here. The Greater Good Rescue Bank delivered pallets of cat and dog food and supplies to the The George R. Brown Convention Center in Houston, Texas — where families were allowed to seek shelter with pets of all species. It also supplied medical supplies and vetting for animals being evacuated to make room for the influx of lost/found pets. The organization partnered with Small Animal Task Force of the Texas Animal Health Commission, Texas A&M AgriLife County Extension offices and FEMA Logistics to ensure over 1 million pet meals and critical supplies are delivered where needed. Additionally, it has given grants to assist rescue missions, including Wings of Rescue, Code 3 Associates, International Fund for Animal Welfare, Red Rover, Humane Society of the United States, MuttNation, San Antonio Pets Alive, San Antonio Animal Care Services, SPCA of Texas in Dallas, Houston SPCA and the TULSA SPCA. Corporate gifts have been provided by Purina. To support the Greater Good animal rescue mission, donate here. This shelter has taken in over 1,000 found cats and dogs in the wake of Hurricane Harvey. It is now seeking adult volunteers to do a variety of tasks, such as assist with animal handling to get all found animals photographed, sort donations, get kennels for dogs and cats set up and cleaned and do laundry. The organization could use donations of newspapers, pet supplies, and even some drinks and snacks for the many volunteers working in very hot conditions. Animals will be posted petfinder.com to assist reunion efforts. Donations cane be made here. As an emergency intake partner of the Humane Society of the United States, Seattle Humane was prepared to take in up to 100 dogs and 200 cats from the Houston area in order to make room for incoming rescues post-hurricane in the Texas area. Delivered by Wings of Rescue on their own private plane, cats and dogs are now finding forever homes in Washington state. 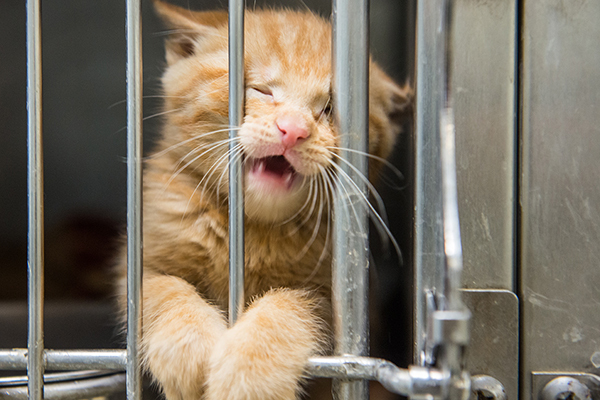 You can support Seattle Humane here. Photography courtesy Felines and Canines. 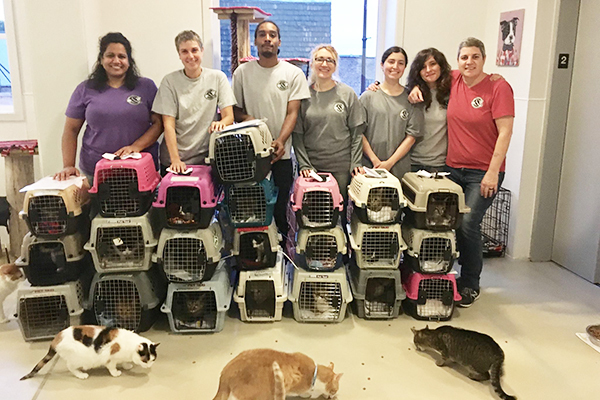 After assessing needs with the Anti-Cruelty Society in Texas, this Chicagoland rescue determined which cats were most in need of help and had 22 felines airlifted out of danger’s way, to find them forever homes in the Midwest. Its focus was on taking in special-needs cats that might be harder to adopt including FIV+, senior, sick and injured cats. And it’s looking forward to accepting another plane full of felines (who were orphaned before the hurricane hit, and are not lost pets) in the coming days. Donations can be made here. This organization is on the ground in Houston helping make stories like this one about Gabrielle and her 4-month-old kitten, Aurora, possible. Make a donation here. As always, research organizations before donating to make sure you are OK with how your money will be spent (on animals, salary, marketing, etc.). Tell us: How are you helping animals affected by Hurricane Harvey? Please share any links and additional ways to help in our comments section! Hurricane Harvey was big disaster. Thanks to the volunteers and organisation who came out and helped in the hour need. I also support and donated some money from my side for animal shelters. Thank you for writing this piece of article and shared all the resources to help and find the lost pets. I’m with the American Pets Alive! conference, a conference designed by Austin Pets Alive! to share the programs, practices and policies that brought Austin to No Kill status. Without the strategies and programs developed over time through trial and error, we wouldn’t have been able to assist other communities. Our goal is to teach others how to build their own No Kill communities. Thanks for posting this important information! I’ve now donated to several of the groups listed. Thank you for spreading the word on these important organizations and their rescue efforts on behalf of so many people & animals! I’m impressed and grateful for all the resources for pet owners and their pets. I didn’t know that pets are now included in rescues. I helped after Hurricane Katrina and heard stories about people who wouldn’t leave their pets, who subsequently died. Thanks for letting your readers know how they can help. Blessings to those helping in the aftermath of Hurricane Harvey.